Phyllornis venusta Bonaparte, 1850, Sumatra. 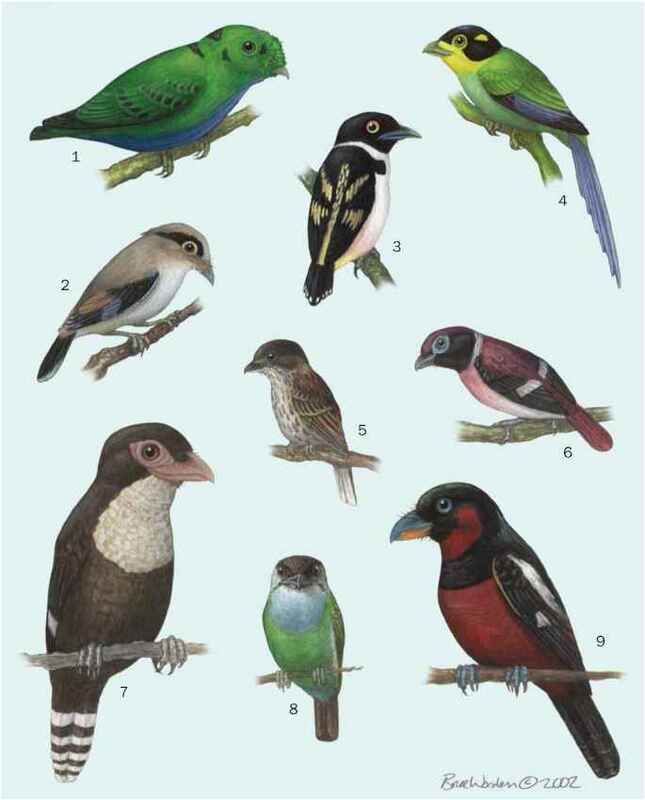 French: Verdin a front bleu; German: Blaustirn-Blattvogel; Spanish: Verdín Enmascarado. 5.5 in (14 cm). Green plumage with blue forehead, cheek, and upper throat. Presumed similar to other leafbirds. FEEDING ECOLOGY AND DIET Presumed typical of genus. Near Threatened, due primarily to deforestation. Locally common in some parts of habitat. Solidly built. 10 in (25 cm), 2.5 oz (75 g). Males have black un-derparts, wings, and tail; upperparts and undertail-coverts are a distinctive ultramarine blue. Females are a uniform dark turquoise-blue with black flight feathers. Both sexes have red eyes. Coastal southern India, eastern Himalayas, Myanmar, Yunnan, Indochina, Malay Peninsula, Java, Sumatra, Borneo, and western Philippine island of Palawan. Primary and tall secondary forests. May occur in flocks of up to thirty birds, largely staying in upper canopy, though descending to bath in streams. Loud melodious whistles are typical. While known to eat insects and nectar, primarily fruit eaters, specializing in figs. Monogamous. Nest is a loose platform of twigs, lined with fine plant materials, in fork of leafy tree. Clutch is two olive-gray, brown splotched eggs. Not threatened, due to enormous range, but many populations are at risk due to forest destruction.